Quantity Limited - 21 left! The Flap Card was first introduced in 1922, in Professor R. Kunard's Book of Card Tricks. In the decades since, it has become a staple in the routines of magicians worldwide, used to produce all sorts of stunning effects. 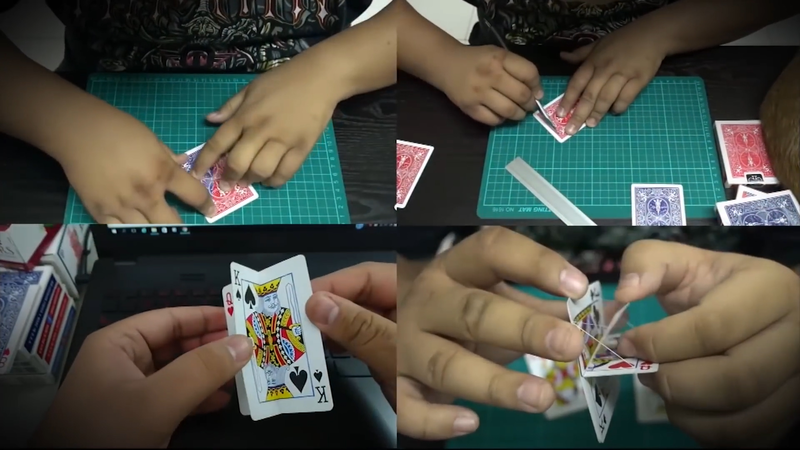 However, limitations of the original 1922 design constrain these performances: magicians must precisely position their audience, keep constant pressure on the card surface, and perform tricks almost immediately after setup for best results. Over many months of extensive research, Hondo has refined the Flap Card design to allow for faster flips and the near-complete elimination of fold lines and uneven surfaces. This means that you (yes, YOU) will be able to perform for audiences on all sides AND up close, with any type of card you'd like: the design looks great on Aces, number cards, and blank cards alike. Not only that, but Hondo's specialized locking mechanism will allow you to hold a flip, hands-free, and release it whenever you're ready. And the most exciting news: you will now be able to flip the same card TWICE, showing a total of three different surfaces to stun and amaze your audience. This product includes a PHOENIX Jack to Queen Modern Flap Card.